Two important truths you can learn from God’s Word are these: you are what God says you are, and you can do what God says you can do. These truths are self-evident because God is what He says He is, and He can do what He says He can do. In this chapter, I am primarily concerned with sharing the truth that you can do what God says you can do. I want to inspire you to go beyond reading about it and talking about it. I want to motivate you to make the power of God which is resident within you effectual in every situation. For victory in your own life and effectiveness in helping others, consider the following verses with an alert mind. “The people that do know their God shall be strong, and do exploits” (Daniel 11:32). We ought to know the strength a believer has. The people who are now sons and daughters of God are strong. You have the same power resident in you that raised Christ from the dead and set him at the right hand of the Father (Ephesians 1:19,20). Thus it is no longer a question of whether the people of God shall be strong — they are strong. But this verse also declares that they shall do exploits. It is up to us to believe and manifest the greatness of the power that God has given to us. Never has there been a day when there is such a great need for believers to operate the power of God in their life and meet the needs of humanity. We need believers who, when they operate the power of God, know they are doing it exactly as the Word says, for this is the only way it will be effective. “Jesus answered and said unto them, Ye do err, not knowing the scriptures, nor the power of God” (Matthew 22:29). Is this not the problem with which we are faced? Multitudes of believers do not know the Word of God, nor how to operate the power that God has given to them. All kinds of ridiculous things are going on in the name of Christ, and there are multitudes of people running after those who do these things. Thank God for teachers who share with us the Word of God and make known the power of God that is resident within the believer. “I can do all things through [in] Christ which strengtheneth me” (Philippians 4:13). The text reads, “I am strong for all things…” How many things? All things. There is not one thing for which I am not strong. Also notice verse 11, “Not that I speak in respect of want: for I have learned, in whatsoever state I am, therewith to be content.” I am self adequate. I have everything I need, and there is no situation that I could not be master of, if I so desire. “I can do all things” — who does the “I” refer to? God? Christ? No, it refers to Paul, by the Christ in him. Not Paul in his own strength, but Paul as a son of God, with Christ in him and Paul being complete in Him. 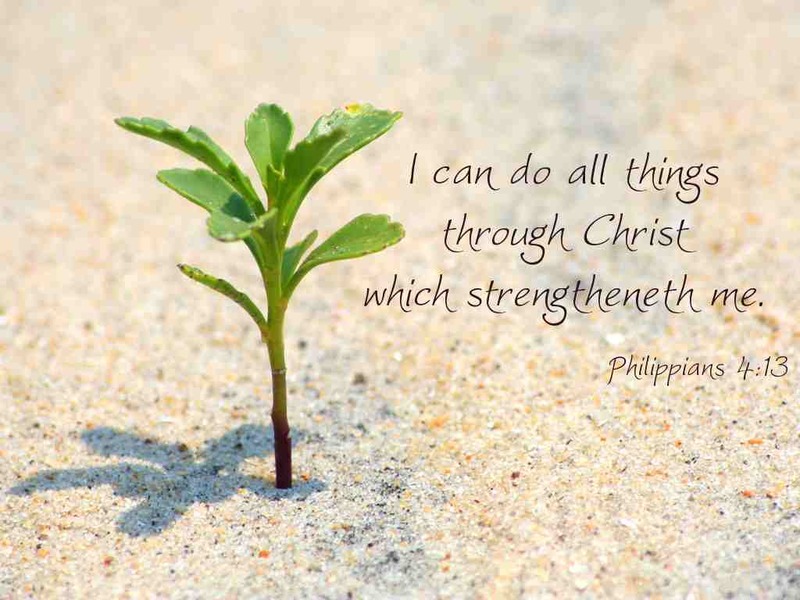 “I, Paul, can do all things in Christ.” If the Word says I can do it, then can I? Yes. I am self-adequate for everything. I can do all things in Christ which strengtheneth me. But if I do not want to rise up and believe, I am going to do nothing. I am strong, but do I want to do exploits? I have the power of God in my life, but when the need arises, do I rise up and believe? My believing determines the situation. Now I recognise the fact that there are many wonderful and dedicated men of God whose believing has risen far beyond their knowledge of the Word. By means of their believing, they have done exploits. They have stepped out, and are, at least partially, meeting the needs of humanity. However, many do not know what they have. Sometimes they are working the power of God; at other times they seem to be working some other power. They do not know the difference. They are active in their fields because of their believing; not because of their prayer and fasting; not because of a “double portion”; not because they sought “the anointing”. When I know what the Word teaches, my believing still determines whether I do anything or not. When I line up my believing with the Word of God, I will “do all things.” There is a reason why I can do this. Notice Ephesians 1:3, “Blessed be the God and Father of our Lord Jesus Christ, who blesses us with all spiritual blessings in heavenly places in Christ.” I can do it because I am blessed with heaven’s best. It is not a case of a “double portion,” I have completeness (Colossians 2:10). When the teapot is full, it is full; you cannot put any more tea in it. When the believer is blessed with all spiritual blessings, he is blessed. He doesn’t have to pray and fast for it, nor seek after it. “All these are the twelve tribes of Israel: and this is it that their father spake unto them, and blessed them” (Genesis 49:28). Jacob was dying and had all his sons around him. He gave each one a specific blessing, but it was not the same blessing for each one, nor necessarily even in the same measure. This is a tremendous difference from the administration we are now in. We are all blessed with the same amount of spiritual blessing, which is all spiritual blessing. Every believer at the moment of the new birth starts with the same amount of cash in the bank, spiritually speaking. God has blessed us all alike with the same supernatural equipment, Christ in us, to meet the needs of humanity. Another reference in the Old Testament is interesting. In Genesis 27 Isaac’s eyes were getting dim, and he was tricked into giving Jacob the blessing that belonged to Esau. Esau came to his father and said, “Is not he rightly named Jacob? for he hath supplanted me these two times: he took away my birthright; and, behold, now he hath taken away my blessing. And he said, Hast thou not reserved a blessing for me? And Isaac answered and said unto Esau, Behold, I have made him thy lord, and all his brethren have I given to him for servants; and with corn and wine have I sustained him: and what shall I do now unto thee my son? And Esau said unto his father, Hast thou but one blessing, my father? bless me, even me also, O my father. And Esau lifted up his voice, and wept” (verses 36-38). There are still a lot of Christians praying and pleading for a blessing, as if God were unwilling to bless them. Some of them think God is deaf too, so they shout out loud. They are, in their thinking, still in an earlier administration. The administration of Ephesians 1:3 says God “blesses us with all spiritual blessings in heavenly places in Christ.” You need only to read the Word, believe what you read, and then operate and manifest it to meet the needs of the people. “Now unto him that is able to do exceeding abundantly above all that we ask or think, according to the power that worketh in us” (Ephesians 3:20). It is according to the power in us that He is able to do exceeding abundantly above all that we ask or think. The word “power” is dunamis, the inherent power of God received at the new birth. The word “worketh” is the word “energize.” It is according to the inherent power of God that is energized in us. The moment I step out on the basis of the Word, and will to manifest the power of God, at that very moment, there will be a manifestation to meet the needs of the people. We need to maintain that keen edge of enthusiasm, ready and willing to meet the need whenever and wherever it is. There is a danger that in knowing the accuracy of the Word we become “intellectual.” We sit back and rest on our laurels and think, “I’m sure glad I know it all.” You and I as believers should constantly remind ourselves that we are sons and daughters of God, and we do have the power of God in our lives. We also need to be reminded of what we can do with that power of God. God has done His part by giving us power from on high. The act is our responsibility. Every believer has the gift, and we can all belong to the group who act. “Not that we are sufficient of ourselves to think anything as of ourselves; but our sufficiency is of [from] God; Who also hath made us able ministers of the new testament; not of the letter, but of the spirit: for the letter killeth, but the spirit giveth life” (I Corinthians 3:5,6). He has made us able ministers; that is, men who have enablements because we have received sufficiency. Whatever we need to do God’s work we have received from God. Now we must rise up and minister. It is that simple. “And the things that thou hast heard of me among many witnesses, the same commit thou to faithful men, who shall be able to teach others also” (II Timothy 2:2). “Who shall be able” again refers to able men who are filled with enablements, in this case, able to teach others. A tool chest filled with tools is full, and those tools were designed and produced to do a certain job. However, just because you have a tool chest full of tools does not necessarily mean that the job will get finished. You have to rise up and use them. It is the same with the operation of the power of God. We have the tool chest; it is loaded; we just need to know how to use what we have. Did you ever consider why Jesus felt so confident about the future of the church, in saying that the gates of hell would not prevail against it? Why did He leave the organization in the hands of twelve men who often failed to do what He had told them to do? I believe He had received revelation and knew what power would be in their lives. Why did the Apostle Paul go into a town to teach the Word, get people saved, and then the next day leave town? He didn’t have any organized follow-up, nor a radio or TV program; he just walked out of town. Why? He knew the power of God was in their lives. I believe he taught them how to use it. The Word tells us that the early Church taught believers the power resident in the name of Jesus, which would include how to operate that power. Paul knew that with the power they had in their lives they were able to meet every situation that they would ever come across. He committed what he knew “to faithful men, who shall be able to teach others also.” Teach them what? Teach them what the Word says they are; teach them how to recognize the Christ within; teach them how to operate the power of God in their lives. “Put on the whole armour of God, that ye may be able to stand against the wiles of the devil” (Ephesians 6:11). What is the whole armour of God? The whole armour must be everything that God has provided for you, including the manifestations of the spirit. Not just part of the armour, but the whole armour is needed to stand. Notice we are exhorted to “put on” the armour. This is works; action is needed. We al ready have the ability resident within us, the manifestation is what we are to “put on.” Manifesting the power of God in your life enables you to hold your ground against the wiles (methodeia, the methods) of the devil. “Wherefore take unto you [analambano, into manifestation] the whole armour of God, that ye may be able to withstand [resist] in the evil day, and having done all, to stand” (verse 13). Let us rise up and manifest the power of God to meet the needs of this day and age. This entry was posted in Bible Teachings, Inspirational Messages and tagged christ in you, christ who strengthens me, christian, god is strength, Holy Spirit, I can do all things, in christ, philippians 4:13, what does god say we are. Bookmark the permalink.